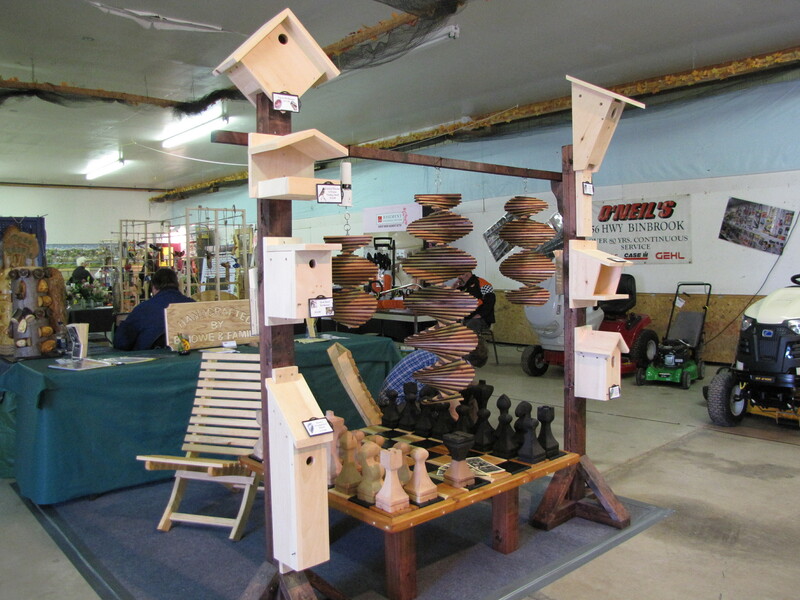 On Saturday and Sunday past (April 30 / May 1, 2011) B.Howe & Family was represented at the Binbrook Craft and Home Show. It was our first foray into the world of Craft Shows and from our point of view it was a success. Most venders enter into a show with the hope of making enough sales to cover their costs plus a little extra. Unfortunately, the attendance at this show was very low and most of the venders were unable to break even. We did get to hear many theories as to why attendance was so bad, which gave us an interesting look into the minds of the veterans. There was also plenty of time to wander through the other displays and see the different ways people show their products, and to be able to talk to them as a peer rather than a customer. We picked up many hints and tips about how the shows work and change, and which shows can be good or bad. Our focus for this show was to gather reactions and opinions with regards to our own products. We wanted to show them to people who were not concerned with sparing our feelings, and had different tastes than ours. This show was to be a sort of product testing ground for us. Of course we already had our own opinions about what people would think, which items they would be drawn to, and which items they would barely notice. We couldn’t have been more wrong. 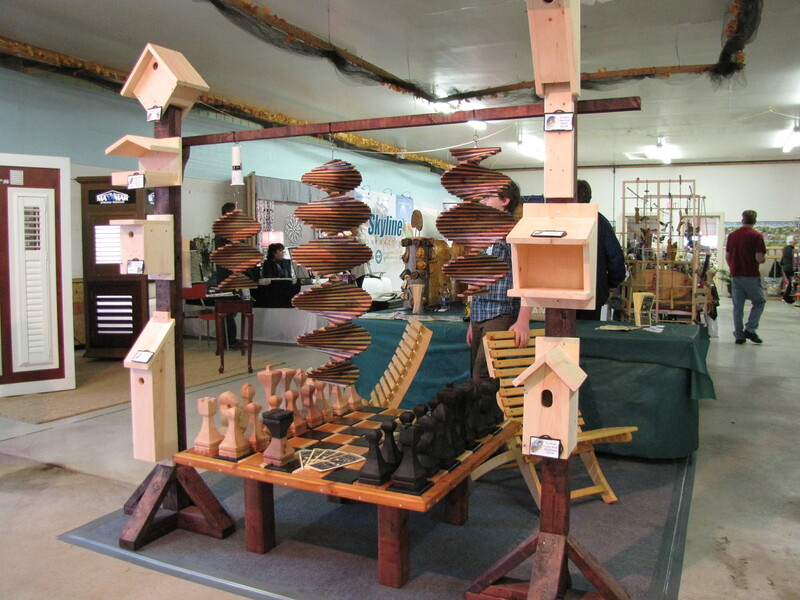 As you can see from the photos our display consisted of the cedar chess set, framed by the birdhouses on either side, and the whirlwinds hanging above. We placed a couple of the camp chairs behind and a table beyond that where we had our sign, brochures, album, etc. A last minute addition was the rug tiles, which paid for themselves the first day by sparing our backs and legs from standing on concrete for 6 hours. The chess table stole the show. So much so that a few people walked away without seeing the other items at all. It generated the most comments and discussions, and we are extremely pleased with the response to it. The birdhouses drew some attention. People seemed to like the utilitarian style, commenting equally on the fact that they will fit into almost any yard and that they are a blank palette for kids to decorate. We thought the whirlwinds would grab a lot of attention, however only a few people commented on them. The comments were all positive, however we feel that there weren’t enough to lend a confident impression. The camp chairs went largely unnoticed, and we believe this is our own fault. We did not have them tagged or labelled so visitors to the booth may have simply thought they were there for us to sit on. We will be addressing this if we do another show. So with that we have to label this show a success. We learned a lot about the show process, and about our own products. We have some ideas to further or better the existing line of products,and ideas for new items in new directions. Thanks to everyone at the show who had the time to answer our questions and offer advice, and a special thanks to all the shows visitors for offering your comments and opinions. If you have been following our posts, then you’ll be aware that we looked into showing our products at a large trade show a little while ago. That didn’t pan out, simply because we weren’t ready to take that kind of a leap yet. Well, if good things come to those who wait, then perhaps we will do well with this new plan. Last week the opportunity arose to rent some floorspace at the Binbrook Home and Garden Show put on by the Binbrook Agricultural Society each year. We only had to deal with one email address, and one phone number. We weren’t required to contact one person about electrical, another about signage, another about tables, yet another about carpets. The application form was simple. A one page application consisting of contact information, product type, and display requirements. There was a spot to request electricity, and table rental was part of the final cost calculation. Only one payment to make. After we figured out the space cost, and table rental fees, we only had to write one cheque. Where the large trade show was going to costs us several hundred dollars for the cheapest booth in the worst location, this show is giving us a central booth in a good traffic area with a table for less than $100. It’s closer to home than the larger show, so we don’t have to factor in the costs of a hotel room for a weekend. The shows insurance covers the vendors, so we did not have to get our own. We won’t be surrounded by $10,000 displays, so we can keep our own display simple and within our means. Leading up to our signing for the booth, we only had to deal with two people. One very nice woman who we had email and phone conversations with, and her daughter. That was it. It is a long running show, in a small town, and from what we can tell it attempts to maintain the neighbourly feel that you don’t find in the more corporate shows. Binbrook is a satelite town of Hamilton, and there is a good chance that it will draw a customer group out of the city. This venue showcases local craftsmen and businesses in the fields of home and garden design and decor. A good chance for us to discover how we fit into the scheme of things. We will be spending the next couple of weeks getting ready for the show. The brochures are ready, business cards are on their way, and soon the signs will be made and the products packed. We’ve worked out a tentative display floor plan, and lists of the things we still need to acquire. It’s fun. It’s exciting. It’s even a little scary. If you find yourself in the the Binbrook area on April 30th, or May 1st, please stop by the Binbrook Fairgrounds and see us at our booth. We’d love to hear what you think.